'The next great war will start inside us. In the next stage of evolution, mankind is history'. Michael Crichton would have loved this discovery: research has shown that about eight percent of human genetic material comes from a virus and not from our ancestors, according to researchers in Japan and the U.S. The genomes of humans and other mammals contain DNA derived from the insertion of bornaviruses, RNA viruses whose replication and transcription takes place in the nucleus. Research led by Professor Keizo Tomonaga at Osaka University in Japan shows virally transmitted DNA may be a cause of mutation and psychiatric disorders such as schizophrenia and mood disorders. The findings were in an article by University of Texas at Arlington biology professor Cédric Feschotte in the Jan. 7, 2010 issue of Nature magazine. Feschotte speculates about the role of such viral insertions in causing mutations with evolutionary and medical consequences. The assimilation of viral sequences into the host genome is a process referred to as endogenization, which occurs when viral DNA integrates into a chromosome of reproductive cells and is subsequently passed from parent to offspring. Until now, retroviruses were the only viruses known to generate such endogenous copies in vertebrates. But Feschotte said that scientists have found that non-retroviral viruses called bornaviruses have been endogenized repeatedly in mammals throughout evolution. Bornavirus (BDV) owes its name to the town of Borna, Germany, where a virus epidemic in 1885 wiped out a regiment of cavalry horses. BDV infects a range of birds and mammals, including humans. It is unique because it infects only neurons, establishing a persistent infection in its host's brain, and its entire life cycle takes place in the nucleus of the infected cells. 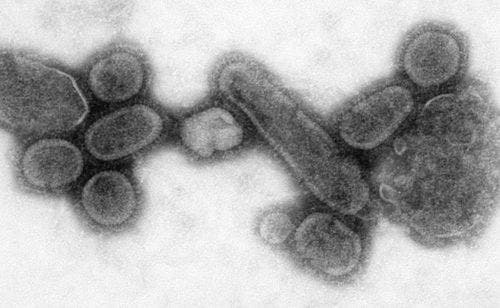 This intimate association of bornavirus with the cell nucleus prompted researchers to investigate whether bornaviruses may have left behind a record of past infection in the form of endogenous elements. They searched the 234 known eukaryotic genomes (those genomes that have been fully sequenced) for sequences that are similar to that of BDV. "The researchers unearthed a plethora of endogenous Borna-like N (EBLN) elements in many diverse mammals, " Feschotte said. The scientists also were able to recover spontaneous bornavirus insertions in the chromosomes of human cultured cells persistently infected by BVD.Based on these data, Feschotte proposes that BDV insertions could be a source of mutations in the brain cells of infected individuals. "These data yield a testable hypothesis for the alleged, but still controversial, causative association of BDV infection with schizophrenia and mood disorders," Feschotte said. The research in Feschotte ‘s laboratory largely focuses on transposable elements, the genetic elements that are able to move and replicate within the genomes of virtually all living organisms. Not all scientists consider the link between Borna virus and human psychiatric disease to be conclusively proven. A recent study found no borna virus antibodies in 62 patients with the deficit form of schizophrenia.